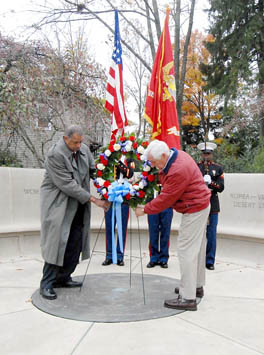 USING PRINCETON SPIRIT TO HONOR THE VETERANS: John Witherspoon Middle School Principal William Johnson, left, helps Spirit of Princeton chair Raymond Wadsworth hang a wreath at the annual Veterans’ Day ceremony at the All Wars Monument at the corner of Nassau and Mercer Streets. Nickolai Stevenson, a lieutenant in World War II who was in the first wave of the invasion force of Guadalcanal campaign, was the featured speaker. Amid a swarm of protestors, increased police detail, and national news coverage, Princeton Township Municipal Court Judge Russell Annich Jr. upheld his decision Tuesday afternoon to label as “vicious” and euthanize Congo, a two-and-a-half-year-old German shepherd for attacking a landscaper at the dog’s owners’ Township home in June. Even though a 20-acre wooded expanse on Bunn Drive in Princeton Township’s northwestern section has long been zoned for development, environmentalists and residents filled Township Hall Monday to plea for a reconsideration of development zoning along a section of the Princeton Ridge. As World War II veteran Nickolai Stevenson spoke of the constant presence of war in modern time Monday, a large crowd watched, absorbing Mr. Stevenson’s notion that Veterans’ Day a “day of memory,” is, in fact, a “shared day of memory. For 20 minutes last Sunday, the Princeton University mens basketball team seemed to have picked up where it left off in last season when the Tigers plummeted to the Ivy League cellar. Ali Prichards career ambition is to become a basketball coach. Steve Everette was bursting with pride as he watched his Princeton High football team warm up for its Central Jersey Group III quarterfinal game against Long Branch. Shelley Frisch adores coffee. Even more than the flavor and kick of the beverage itself, being surrounded by the aroma inspires her. Most afternoons, Ms. Frisch can be found at any one of Princeton’s local coffee houses — she’s particularly fond of Small World, where we met for this interview — working on her latest book. Her translation of German author Jürgen Neffe’s Einstein: A Biography was published this year and her latest work, The Secret Pulse of Time by Stefan Klein, will hit bookstores this month. As the unsung heroes of foreign literature with the potential to turn works of national acclaim into international bestsellers, translators are now beginning to be acknowledged alongside authors. The cover of Neffe’s biography also bore Ms. Frisch’s name. Here, the Jefferson Road resident, who has been a translator and writer since 1995 and just received the 2007 Modern Language Association’s Scaglione Prize for a Translation of a Scholarly Study of Literature, discusses the work that coffee makes possible.